"20mm" redirects here. For the model scale, see List of scale model sizes. The 20 mm is a specific size of cannon or autocannon ammunition. Few weapons (aside from shotguns, large game hunting rifles, and heavy caliber muzzleloading "rampart" or "wall guns" popular in the early to mid 19th century European militaries) have been built to fire projectiles between 12.7mm (such as the 12.7mm NATO) and 20 mm, though several 13mm, 14.5mm, and 15mm heavy machine guns were used during World War II, such as the MG 131. The 14.5 mm is still used by some Soviet machine guns, such as the KPV and anti-tank rifles such as PTRS, PTRD, and NTW-20. 15mm was also widely used by the Germans during WWII such as in the MG 151, and the British as well to a lesser extent in the 15mm version of the Besa machine gun, which was used on armored cars and some light tanks. Since 20mm is the cutoff point where most nations switch from bullets to shells, it has come to also generally be the cutoff point between weapons classified as a machine gun or a cannon. This varies, however. For example, in World War II, Japan classified any weapon over 11 mm as a cannon; thus, in Japanese records, their 12.7 mm Ho-103 aircraft gun is classified as an autocannon, as it used explosive shells to overcome its lower muzzle velocity compared to American 12.7mm/.50BMG weapons. A machine gun does not fire shells, so historically a weapon that fires shells below 20 mm can be a cannon. An accurate description always mentions, in addition to caliber, whether the weapon fires bullets or shells. A small number of anti-tank rifles were produced in 20 mm and larger calibers. 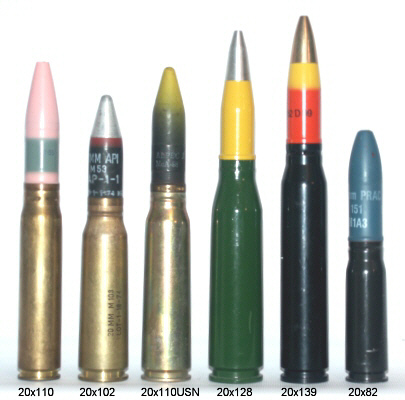 20 mm cartridges have an outside bullet diameter and inside barrel diameter of 0.787 inches (20.0 mm). Projectiles or bullets are typically 75 to 127 mm (3–5 in) long. 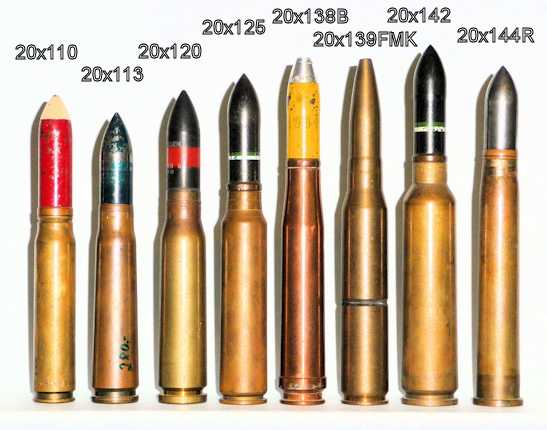 Cartridge cases are typically 75 to 152 mm (3–6 in) long. Many but not all 20 mm rounds have an explosive filling and detonating fuze. As an example, the RT-20 sniper rifle fires a 20×110mm 130-gram projectile at a muzzle velocity of 850 m/s. For a simple slug this gives a muzzle energy of 47 kilojoules. 20×102mm round with .50 BMG rounds, golf ball, and a stick of SDRAM computer memory. Like most cannon ammunition, armed forces typically use 20 mm caliber weapons against large targets, such as vehicles, buildings, or aircraft. Though lethal against individual soldiers, 20mm ammunition is so large and heavy that its effects are inefficient against relatively small targets. Each weapon is listed with its cartridge type appended. 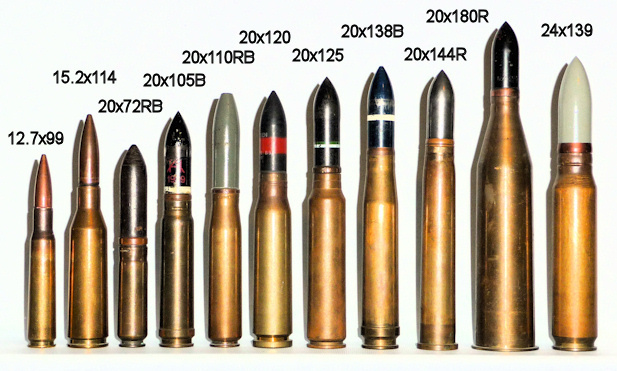 Cartridge type indicates the diameter of projectile and the length of the cartridge that holds it; for example 20×102mm is a 20 mm projectile in a 102 mm long case. Only rarely do two designers use the same case length, so this designation is usually definitive. 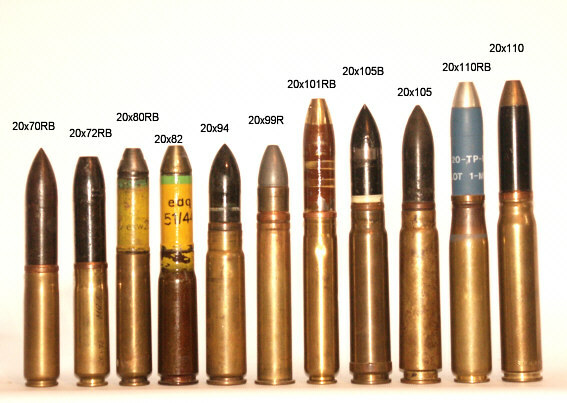 Some cartridge types have additional letters or information about them listed. ^ Editor. "Big Shots – Amusettes, Jingals And Other Super-Sized Firearms | Militaryhistorynow.com". Retrieved 2016-03-28. ^ Williams, A.G. & Gustin, E. (2009): World War 2 fighter armament effectiveness.